Printed from http://www.bodytalksystem.com//learn/news/article.cfm?id=1080 on Apr 22, 2019. "Everybody can be great. Because anybody can serve. You don't have to have a college degree to serve. You don't have to make your subject and your verb agree to serve. You don't have to know the second theory of thermodynamics in physics to serve. You only need a heart full of grace. A soul generated by love." I would like to thank the IBF for supporting the BodyTalk Access Outreach program in Kenya. 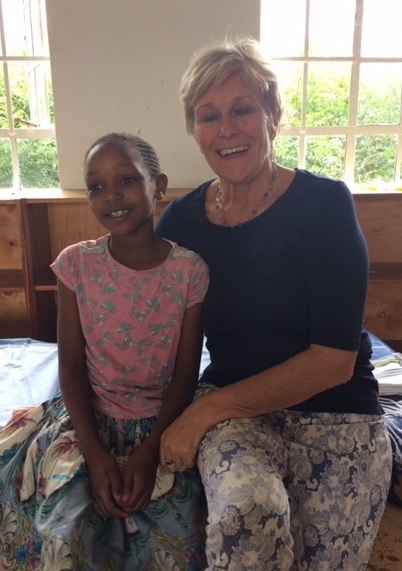 And a big thank you to Homeira Ghanongooi-Franke for her commitment and enthusiasm in providing BodyTalk Access training to the students of Sai Seva Primary School in Kawangware, a slum in Nairobi, Kenya. I was privileged to coordinate this Outreach event. The students of Sai Seva school all come from very poor and disadvantaged backgrounds. The school was founded by a Kenyan citizen named Ms. Eugene (Gene) Marion Yakub and financially supported by a German woman who ended up leaving Kenya around eight years ago. She was a follower of Sai Seva, a holy man in the Jain culture/religion. When she left Kenya, she asked her friend Satwinder Syan if she would be willing to look after the school. Today, Satwinder and a group of seven other friends look after the school, students and teachers, as well as all that is needed in terms of financial and other support. On September 13 and 14, 2018, Homeira and I went to the school in the company of the Friends of Sai Seva. They were there to assist us in organizing these two special days. The students of the upper three class levels were there (approximately 45 children) as well as 10 teachers from both upper and lower classes. We sent the students of the lower classes home for the day, so all the teachers could join us in the training (see photo below). The school recently moved to new premises. The classrooms are ready; however, the dining room and the church are still being built. For a new church to get a building permit, it needs to have a school on the premises. This Baptist church was happy to rent out the land to Sai Seva school, even though their religion is not Christian. The focus of Sai Seva is on human values and is non-denominational. The church was the venue we chose to teach Access, even though it was only a shell and rooftop at that point (as you can see in the photo above). Windows, doors and finished floors would be completed later. We planned to teach for two mornings from 9:00 am to 1:00 pm. To get there, we had to cross town, which meant it was an early wake up call to get there in time. The students and teachers were very interested in learning the BodyTalk Access techniques, as you can see in the photo below where the students gather around Homeira to view her demonstration. After the first day of training, we already received feedback from a student who worked on his dog with a bleeding wound, which settled easily. And the deputy head teacher worked with his family to help them de-stress after work. The school starts every morning with an assembly, when all students and teachers get together and focus on human values and do some meditation--"sit still time." This time is now scheduled to include the Access techniques. The older kids who are now BodyTalk Access technicians are the examples for the younger children. We decided to leave the manuals with the school rather than with individual students. Every student got a Certificate (see photo below), a print out with an overview of the Access techniques, and a print out of all Reciprocals. I feel assured that the teachers will follow up on the Access techniques. And the Friends of the School will make sure to check on this as well. So I expect these valuable techniques to be in good hands! Today, I contacted the headmaster of Sai Seva School and I asked for some feedback. He told me that every morning they do the whole Access routine. Both the children and teachers notice the positive effects on behavior, the responses to each other, and to stressful events. The students in the highest grades are starting their exams next week. It would be interesting to see how they are dealing with this! We will make sure that we get some more feedback with the help of the Friends of the school. To be a coordinator for BodyTalk is time-consuming. It takes a lot of effort to get people interested, specifically in a part of the world that has not yet been exposed to it and is very conservative. To plan a BodyTalk Outreach class is easier to organize but needs more follow up. I hope to coordinate more BodyTalk Access Outreach programs in 2019! The nomadic communities in the north of Kenya are so far removed from any health clinics. It would be great to empower them, so they can take their health into their own hands. I hope to be able to get to them through organizations who are active in these areas. I realize that what we do is just a drop in the ocean. There are so many disadvantaged children in this part of the world. If we could get more schools involved and more teachers trained it could make a great change to those vulnerable lives. Marie-José is a certified BodyTalk Practitioner, living in Nairobi. She is married with three grown children. Originally Dutch, she has lived in East Africa for over 30 years. She studied Child Development and Health and has a degree in Art and Expression. The photo at left was taken at Restart Africa, an Orphanage in Gilgil outside Nairobi. Marie-José went there with Instructor Homeira Ghanongooi-Franke and two other BodyTalk practitioners. The children they met that day were all severely traumatized. They did sessions for them and the staff and taught them the Cortices technique. Everyone was very impressed by the work. To learn more about Marie-José, view her IBA bio.